2019 Jane Austen Grand Regency Ball and Supper, Assembly rooms Bath, tickets now on sale!!! Please note when buying mutliples of tickets you need to hit the update button on the checkout page before proceeding and after selecting the qty of tickets you require. Please note the ticket this year includes the afternoon dance workshop/practice, which is betweend 3pm and 4pm this time and the venue are to be confirmed but will be ASAP. Sunday September 22nd 2019. Assembly Rooms Bath. 7pm till midnight. Dance workshop 3pm till 4pm (to be confirmed) at the Assembly Rooms (venue also to be confirmed). This is the first time, and possibly the only time the ball has been held on a Sunday, so we hope to see you all there, to have some fun on a Sunday night! After the huge success of the 2018 ball, we are delighted to bring this event to you again in 2019. 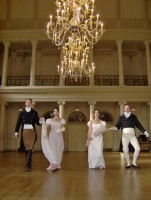 This will be the 16th annual ball we at Farthingale have brought to you, and we very much look forward to seeing all of our regulars again, and welcoming along all of you newcomers, the sight of a couple of hundred people dancing the night away in Regency costume is quite a sight to behold. As usual dress code is Regency so everyone will need appropriate costume. You will enjoy a delicious Regency supper, dancing of the era, card games and generally have lots of Regency fun! As anyone who has attended this ball, in previous years will vouch, there is nothing quite like seeing everyone in the glorious clothes of this era in such a beautiful setting and venue. Please remember to contact us if you would like costume to either hire or buy for this major event for your yearly diary. If you have any questions regarding the Ball, etc., then please feel free to contact us and we will be happy to supply you with the information you require. Thank you for your time and we look forward to seeing you again or meeting you for the first time at the 2019 Grand Regency Ball and Supper. This years tickets all include the afternoon dance workshop/ practice place and time to be confirmed. This is the special group price we are offering for table bookings of 10 people, for the 2019 Farthingale Grand Regency ball and supper!! this will be the cheapest way to buy tickets for the ball, buying this way will save £100 on buying this many tickets individually. Any questions please ask. Please find further info for the ball on the individual ticket info as above. A DVD with great footage of ourJane Austen Grand Regency ball. ."A unique insight, thouroughly entertaining not only for Jane Austen fans" says the front cover of this great little DVD. Also with footage of us here at Farthingale producing costumes and being interviewed at our home based workshop, along with interviews of others associated with the world of Jane Austen and the Re-enacting of this wonderul and very much loved era that is Regency and late Georgian. P&P included within the UK, please contact us for postage anywhere else in the world. Farthingale established 1988, are a family business of costumiers, supplying to museums, re-enactors, TV, and of course many private clients and collectors. We make costumes from all era’s and all styles, please be aware that there is very little on the site compared to what we can actually produce for you so if you don’t see what you’re looking for then please contact us with any questions or requests.